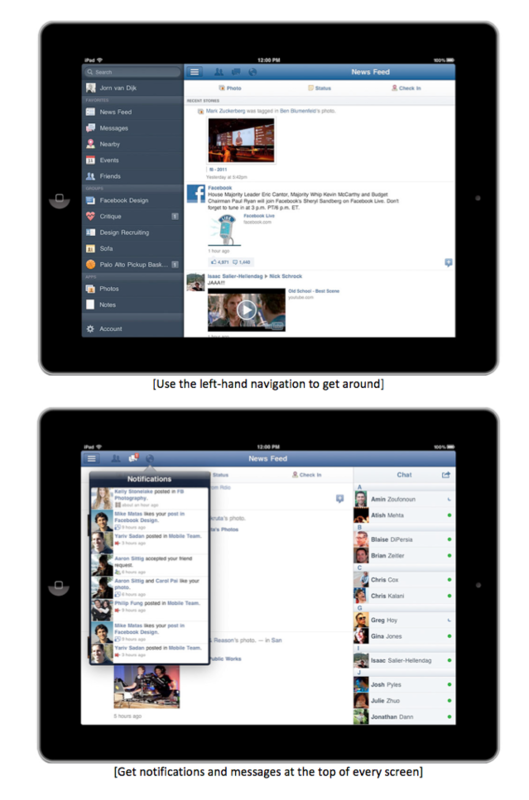 Facebook’s iPad App Is Finally Here. Yes, For Real This Time. No, it’s not a rumor. It’s not a leak. And it’s not going to be pulled at the last minute because of backroom negotiations that may or may not actually be taking place. Facebook’s iPad app is ready for everyone. Yes, after months of delays, rumors, and even a leaked build that made its way into the hands of TechCrunch readers everywhere, Facebook is officially unveiling its iPad app, which has long been glaringly absent (so glaringly, in fact, that several third party developers have gotten millions of downloads for their own ‘Facebook for iPad’ apps). I haven’t gotten to try the official app out myself just yet, but Facebook did give me a verbal walkthrough of its highlights, as well as the following screenshots. It looks good. It looks like Facebook. And it’s going to be the iPad’s most downloaded app of all time in, oh, about two days. You can download it right here. Update: Facebook’s site showcasing the app is live, but it looks like it’s still propagating through Apple’s servers. The app features a slick navigation menu on the left side of the screen, which lets you quickly jump to features like News Feed, Messages, your Groups, and the other places you commonly access on Facebook. The remainder of the app ties together the features you’d expect from Facebook’s mobile experience (like Check-ins) with the features you find on the desktop, like a Chat bar that’s presented alongside the News Feed. Facebook’s iPhone app isn’t being left out in the cold, either — it’s also receiving a UI refresh, including the slick navigation menu. And there’s another new feature that’s very important: Facebook is bringing app discovery to mobile devices. Right now if you browse your News Feed from the desktop, you’ll notice that you occasionally see updates posted by friends using various apps and games. Click on one of the links that appear in these updates, and you’ll be directed to the app in question — this is one way that applications can spread virally across Facebook (another way is through the ‘requests’ channel, which lets users explicitly invite their friends to a certain app or game). Before now these features have been omitted from the mobile version of Facebook, but beginning with today’s launch, they’re receiving deep integration. Say, for example, you were browsing Facebook from its new iPad app, and you saw a friend post a Words With Friends story in your News Feed. If you tapped that link and already had the native iPad version of Words installed, then Facebook would fast-app-switch you over to the game. If you didn’t already have the app installed, it would deep link you to the App Store, where you could download it. And if there wasn’t a native app available at all, then you’d get directed to the HTML5 version. This app integration works with the Facebook’s mobile web version as well. In short, Facebook is doing its best to direct you to the version of the app that will work best on whatever device you’re accessing it from — so if you’re browsing to Facebook from m.facebook.com, you’ll get directed to mobile web version of apps; if you’re browsing from iOS, you’ll get App Store versions; and when Facebook finishes the revamped version of the Android app (it’s in the works), you’ll get directed to the Android Market version of apps whenever possible. This is a big deal for app developers, because it means that mobile application can more easily tap into Facebook’s viral channels. And it also means that invitations and requests will work seamlessly across all platforms, provided that app developers have built multiple versions of the apps (and/or an HTML5 version). This also brings up another question: is this Project Spartan? My colleague MG Siegler has reported extensively on an internal mission at Facebook to urge third party app developers toward HTML5, thereby bringing their applications to far more devices and loosening the stranglehold that Apple has over iOS through the App Store (and that Google has over Android through Market). In the longer term, though, it sounds like Facebook will be doing more with HTML5. It’s already written some developer blog posts on crafting 2D games using HTML5, and Taylor says that Facebook will likely be open-sourcing additional tools to help developers tip their toes into the web development environment. I also asked Taylor about the history of the iPad application, which has reportedly been used as a hefty bargaining chip in Facebook’s negotiations with Apple. Taylor dodged the question, saying something along the lines of, “We work on a lot of things, and we release them when they’re ready to go.” This didn’t entirely make sense, as the Facebook developer who was building the app says it was feature complete in May, and he quit because the social network was taking so long to release it.